The cold weather that has plagued much of the Midwest and East Coast recently can have devastating side effects on vehicles running on diesel fuel. Having a general understanding of some key cold-weather do’s and don’ts can drastically reduce the chances of equipment trouble or even breakdowns during the frigid winter months. When the cold winter months are approaching, fuel manufacturers are already preparing for winter. Fuel manufactures custom blend fuel according to the region where it will be distributed and the weather projections for that region. The major difference in fuels sent to the northern or southern states is the ‘cloud point.’ Diesel fuel naturally contains paraffin wax and the cloud point is the temperature at which the paraffin wax begins to form wax crystals. When the paraffin wax begins to crystallize, it starts to restrict the fuel flow by plugging the fuel filters and even the fuel lines, especially those exposed to the elements such as a fuel crossover line that runs between two fuel tanks. This can lead to some crippling side effects. What can you do to prevent the fuel in your tank from gelling up? First: Monitor ambient air temperature 10 days out and take action BEFORE the extreme cold hits. Second: Be aware of what type of fuel you have in the tank. The cloud point varies greatly depending on the quality and makeup of the fuel. Third: Since knowing the makeup of the fuel you are buying is not always easy to determine, use a cold weather fuel additive like Gold Eagle’s DIESEL POWER!® Complete or DIESEL POWER!® Anti-Gel. Remember, cold weather additives help to prevent the clouding process, but will not undo it. Note: anti-gel must be added before the fuel reaches the cloud point. The cloud point can vary greatly depending on fuel quality and can be as high as +20°F in some fuels. Fourth: Pay attention to the climate changes during road trips or hauls. Tailor your fueling stops and or additive use to the weather and climate conditions you are expecting. Five: Be picky about where you fuel up. Fueling at larger stations or truck stops is usually a better way to go due to the higher volume of fuel they move. 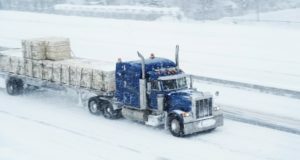 If extreme cold is forecast where you will be hauling, get a cold weather additive in the fuel. An ounce of prevention is worth a pound of cure. The key here is preparation. Follow the steps listed above and be ready for the cold weather. If you suspect fuel gelling, look in your tank for white/yellow deposits or cloudy fuel. The truck will also start hard (if at all), smoke and have a loss of power. Remember a truck not running means downtime and lost revenue. Bundle up and keep hauling this winter! !